Chocolatier Stacey Duff (L) from The Cocoabean Company in Twynholm helps unwrap the latest fibre broadband in Dumfries and Galloway. More premises across Dumfries and Galloway can now upgrade to faster fibre broadband through the £428 million Digital Scotland Superfast Broadband rollout. To celebrate, the Digital Scotland team was joined last week by Cocoabean Company Chocolatier Stacey Duff in Twynholm, one of the many Dumfries and Galloway villages to benefit from the rollout. Thanks to the programme more than 56,800 premises across Dumfries and Galloway are able to connect to the Digital Scotland network, which has now reached Carsluith for the first time, with more coverage being rolled out in Sanquhar and Port William. Work is ongoing, with Openreach engineers continuing work on the ground into 2019. Across Scotland, nearly 920,000 premises are now able to connect to fibre broadband thanks to the programme. Some of the latest local properties passed – including dozens in the Crocketford, Dunscore, Ecclefechan, Canonbie, Mossyard, Collin, Rockcliffe, Kirkcolm and Parton exchange areas – can now connect to the most reliable and fastest residential broadband available as engineers build more Fibre-to-the-Premises (FTTP) to help harder-to-reach homes join the digital revolution. FTTP is capable of delivering the fastest residential broadband speeds in the UK – up to 1Gbps* – about 23 times faster than the current UK average of 46Mbps. Local people need to sign up for the new, faster services with an internet service provider, as upgrades are not automatic. Delivered through two projects – led by Highlands and Islands Enterprise in its area and the Scottish Government in the rest of Scotland – funding partners include the UK Government through Broadband Delivery UK (BDUK), BT Group, local authorities and the EU via the European Regional Development Fund. Whether you own a business, work from home or want to keep in touch with friends and family, fibre broadband enables multiple users to connect to the internet at high speeds. Most of the Digital Scotland deployment uses Fibre-to-the-Cabinet (FTTC) technology, at speeds of up to 80Mbps*. Crucially, thanks to additional investment as a result of innovation and new funding generated by stronger than expected take-up, the programme will deliver new DSSB deployment in every local authority area during 2018 and into 2019, complementing ongoing commercial build across Scotland. 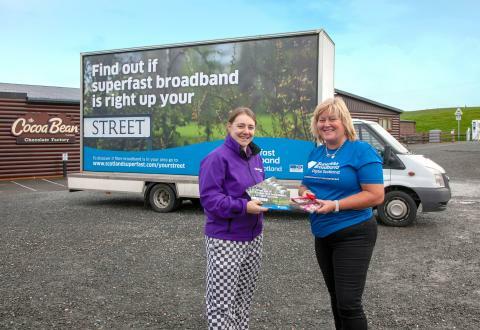 Sara Budge, Programme Director for Digital Scotland Superfast Broadband, said: “It’s fantastic news that the programme has been able to benefit residents and businesses in and around Twynholm. Robert Thorburn, Partnership Director for Openreach in Scotland, said: “The Digital Scotland project and our hard-working engineers have delivered more coverage across the country at faster speeds than expected. “The latest upgrades in Dumfries and Galloway include more deployment of future-proof, ultrafast FTTP, which we’re increasingly using in areas where it’s the best technical solution. * These are the top wholesale speed available over the Openreach FTTC and FTTP networks to all service providers; speeds offered by service providers may vary. Due to the current network topography and the economics of deployment, it is likely that not all premises within selected areas will be able to access fibre-based broadband at the same point in the roll-out. The Digital Scotland Superfast Broadband programme aims to provide fibre broadband infrastructure to parts of Scotland not included in commercial providers’ investment plans, and has reached around 95 per cent of premises when combined with current commercial roll-out plans. We work on behalf of more than 600 communications providers like SKY, TalkTalk, Vodafone, and BT, and our fibre broadband network is the biggest in the UK, passing more than 27 million premises. We’re also the platform for Britain’s thriving digital economy, which is the largest in the G20. Openreach is a wholly owned and independently governed division of the BT Group, and it is a highly regulated business, with more than 90 per cent of our revenues generated from services that are regulated by Ofcom and any company can access our products under the same prices, terms and conditions. For the year ended 31 March 2018, we reported revenues of £5.1bn.